Gary was the best instructor I could possibly ask for and I would definitely rate him five out of five stars! I never thought I would be able to pass my test but Gary gave me the confidence to pass first time! Gary explained everything very clearly and in lots of detail to help me with things I was struggling on. 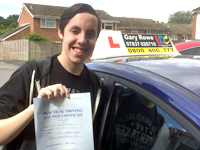 He was also very encouraging – I did not have any confidence when I started driving and without Gary's help I would have never become a confident driver. The LD System was amazing in helping me learn to drive. The workbook had detailed chapters including diagrams which explain everything. It helped me a lot to visualise what I was learning by looking at the diagrams in the workbook. It also included a lesson planner and I found it extremely helpful writing reflections on each lesson. This helped me to remember what I had learnt each week. As well as the workbook, the LDC YouTube channel had extremely helpful videos which explained each new lesson in good detail. It was helpful to watch these videos before each lesson. Gary created a very calm and relaxing environment for me to learn in as I was very nervous to start with, and he remained calm no matter how many times I messed some things up. 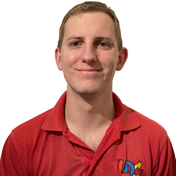 I would definitely recommend Gary as a driving instructor; he remained calm and explained everything in great detail and would always help me improve. I would have never passed my test first time without him! Thanks again Gary!